Four Seasons Flowers & Gifts is committed to quality and service. We choose only the freshest, highest quality flowers and our shop has a professional and caring staff to serve all your floral needs. Your gift will arrive beautifully presented and personalized with your message. Barbara Gingerich has a long professional career history in the retail floral business. Barbara started her career working for her family owned (Talley & Frink) Rainbow Florists in Waterloo, Iowa. Her late uncles, Moes & Herb Frink were the founders of the Flowerama franchise. She later moved to Denver, Colorado and managed a shop for Lehrer's Flowers. 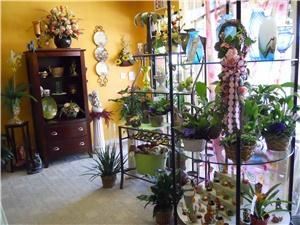 In recent years, Barbara has worked and managed several local Sun City area flower shops. The shop is staffed by its lead designer, James Daniels, who has been acclaimed as one of the best professional designers in Phoenix area design competitions. If you are in the Phoenix vicinity, or from outside of the area, Barbara and the staff at Four Seasons Flowers & Gifts appreciate the opportunity to service your floral needs. Thank you for considering Four Seasons Flowers & Gifts.